^^^^^ "it's never too late to learn that you're a shapeshifter"
Santiparro Alan Scheurman is an intuitive sound healer, artist, musician and writer committed to the active co-creation of a peaceful universe. He helps individuals and groups to heal, become fully accountable in the now, and create inner and outer harmony through guided meditations, vibratory channeling, and altar activations. Santiparro specializes in shamanic sound therapies for humans and non-human peoples to release blockages and assist in the client's process of healing and self-empowerment. He lives in Brooklyn, New York. The name Santiparro denotes “the lens that sees many things not usually seen” and was given by a mara’kame (shaman) of the Wixáritari or Huichol people after a three month journey through Mexico that culminated on a pilgrimage to the Sacred desert of Wirikuta. 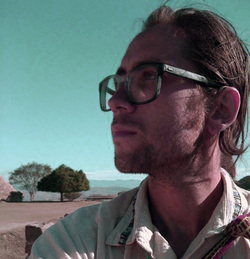 Santiparro is a lifelong student of the initiatic traditions of the world. He is certified in permaculture design, working to restore balance to the Earth through regenerative and sustainable practices. He is one of several co-founders of Golden Drum, a community center for healing, transformation, and the expansion of consciousness located in Greenpoint Brooklyn.